British Columbia (BC) is a top destination for Hong Kong and mainland Chinese tourists and emigrants. Like Hong Kong, it has uniquely beautiful landscapes with both ocean and mountain views. What makes it different from Hong Kong though, is the willingness of its people to both enact policies and pay the cost required to maintain this pristine environment. Since all Chinese can’t emigrate to Vancouver (no matter how furiously they try), can we instead learn from their experience to improve our own polluted environment? This article was contributed by Eveline, an environmental specialist based in Vancouver, BC. 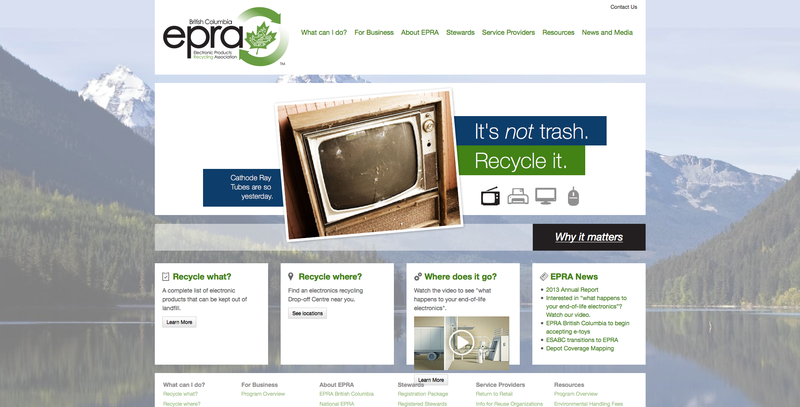 Since 2007, consumers in BC have paid eco fees (green levies) to fund the proper disposal of electronic waste. BC has been at the forefront of this fight in North America with over 15 programs in total and counting – recycling everything from smoke alarms to TVs to fluorescent lights. These programs are fully run by the manufacturers or importers of these goods in BC and funded by eco fees paid at the point of purchase. The eco fees cover the cost of collection, transportation and safe disposal as well as associated administrative costs. These policies are based on the concept of Extended Producer Responsibility, developed by Swedish economics professor Thomas Lindhqvist. It states that (a) a manufacturer’s responsibility includes taking back the broken products they produce and (b) the environmental cost of production and disposal must be included in a product’s total life-cycle cost. It has been implemented by governments worldwide as the way to best manage waste from manufactured goods. What happens to the used electronic products after I recycle it? After paying an eco fee upon purchase, you can drop the product off, free of charge, at designated recycling facilities located all over the city. The device is then sorted and dismantled into its various parts. Machines separate out the various metals, which are then melted down and shipped out to be turned into new products. Plastic and glass are also sold to be turned into new products. Rare elements like lithium and mercury are also removed and re-introduced into the supply chain to make new products. Any money earned is returned to fund the recycling program. Why should I recycle my electronic products? The Earth’s resources are not infinite. Extraction of the rare metals that exist in every electronic product takes an incredible amount of energy to mine, transport and process. In jurisdictions where no recycling program exists, products thrown away by consumers are sent to third world areas and burned. The pollutants released into the air harms not only humans but also the ecosystems and food systems in the vicinity for decades. If disposal cannot be avoided (we advocate fixing and reusing the product for as long as possible! ), the solution must be to recycle it. Recycling these hazardous products will lead to managing pollutants inside a recycling plant and minimizes the demand for raw metals. Have the programs been a success in BC? The answer is an unequivocal yes. According to EPRA, the industry association that manages the program, 23,000 tones of electronics were diverted from the landfill in 2013 in BC alone, equaling 5kg/per person! The awareness levels for these programs have increased dramatically from its inception in 2007 and now 72% of British Columbians know to never throw a computer or TV into the trash. Furthermore, 95% of British Columbians have access to a drop off location and more locations are being added everyday. Hong Kong can learn from the highly successful programs in BC, across Canada and Europe. The density and limited space of Hong Kong is a perfect case to implement an electronics recycling program for two primary reasons. The distance to drop off the unwanted electronic product will be short, and the diversion and recycling these products will be seen immediately as less waste is sent to Hong Kong’s overburdened landfill. I think it’s wonderful that you’re spreading the word on what can be done. Let’s hope the ‘right’ person reads this and starts the process.